A koala doing something: The dark future of Australia. (photo by deeleea on flickr.com)Returning to the subject of promiscuous koalas (and how can anyone be expected to stay away), a recent study by the University of New South Wales suggests that koalas may not be anywhere near as close to extinction as many are lead to believe. In fact, they may be turning Australia into an inbred wasteland (think Mad Max, just with more koalas doing it). Things are never as quiet Down Under as we’d like to believe. The study acknowledges the severe decline in koala populations since European contact with Australia, but goes on to point out that conservation and reintroduction programs have been so successful that the restored koala populations may actually be “degrading their woodland habitats.” This viewpoint is contrary to the messages of groups like the Australian Koala Foundation (AKF), who identify habitat loss as the major threat to a shrinking koala population. What’s more, the study claims that, because the founding groups of koalas were so small, they now have “endured population bottlenecks rendering them genetically depauperate.” That is to say, their gene pool is nothing you’d want to swim in – they’re inbred. Now these sexed-up (and, don’t forget, chlamydeous), Deliverance extras may be putting enough strain on the environment that they will eventually endanger themselves and any other animals that share their habitat. Beyond the obvious solution of culling a portion of the koalas, the study has suggested the use of contraceptive implants, which could be inserted into the animals’ necks, and would slowly release hormones to prevent pregnancy. The complications and expense of this process, on a large scale, pale in comparison to the difficulty foreseen in applying contraceptives to the male koala population. 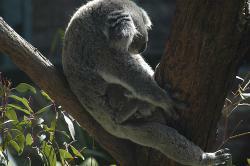 The AKF agrees with some of the study, but says that the damage done by koalas to the environment has been overestimated, and that the University of New South Wales made a mistake in basing their research on small population isolates (where koalas could explode in number and be forced to inbreed). At once criticizing these methods and defending Australian-English stereotypes, AKF CEO Deborah Tabbart stated, "These isolates are like the size of nine smarties on an A4 page."